At a market research conference last year, I subjected myself to a demo of the Oculus Rift, a headset that, in combination with virtual reality movies and games, enables its wearer to have the sensation of being “really there.” In my case, “there” was a window-washing platform climbing the side of a 30-story building in Los Angeles. When the gate to the platform dropped and there was nothing within my line of sight but open air and the street 450 virtual feet below me, my demo guide instructed me to step forward. But though I knew that what I was seeing was an illusion, my rational brain could not override my senses that were silently screaming “No!” Non-compliant, practically paralyzed, I finally yanked off the headset. do we really need Google Cardboard, an Oculus Rift headset or any other virtual reality-enabling devices to be moved by the plight of Syrian refugees? 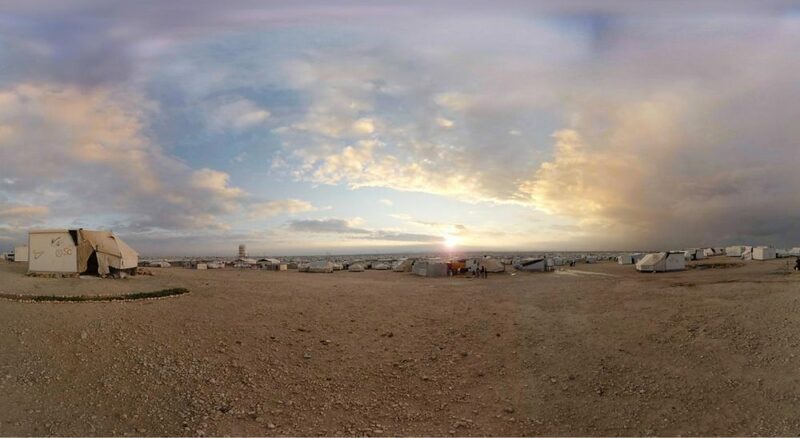 Still when I first heard about "Clouds over Sidra," a United Nations-funded 3D film that creates the sensation of being in the Za’atari refugee camp in Jordan, I confess I was cynical. After all, do we really need Google Cardboard, an Oculus Rift headset or any other virtual reality-enabling devices to be moved by the plight of Syrian refugees? And couldn’t the money spent on this feat of technical wizardry have been better invested in food, water or medical supplies? Still images and video have long been used to arouse emotion and motivate action. But I genuinely wonder if placing comfortable First World technophiles in virtual environments like refugee camps or rural African villages will generate deeper or more durable responses. Neuroscientific research into the action of mirror neurons suggests that it might. Just as a set of neurons fire when you engage in specific actions, a subset of those same neurons fire in the frontal lobes of my brain as I observe you. Indeed, neurologist V.S. Ramachandran describes this phenomenon as “a virtual reality simulation of your mind, your brain” explaining that this process is essentially one of “constructing a theory of your mind — of your intention — which is important for all kinds of social interaction.” By unconsciously copying another person’s physical actions or responses to a stimulus (whether internal or external), it appears that we do a pretty good job of recognizing what caused that response. That study explains a lot. Maybe it’s the cozy feel of his puppy Snowflake’s soft fur that lulls Ted Cruz into characterizing the prospect of allowing in Syrian refugees — at least the Muslim ones — as “nothing less than lunacy.” Perhaps it’s the sense of personal well-being derived from his faith and his multivitamins that enabled Ben Carson, newly returned from the Za’atari refugee camp, to describe it as “really quite nice.” Comfort can dull empathy in even the well-intentioned, and kill it entirely in candidates whose campaigns are playing to the amygdala, the area of the brain that generates fear and aggression. Meanwhile, Sidra, a 12-year-old resident of the Za’atari camp, though clearly a curious child, is not concerned with neuroscience or virtual reality. She wants a home — a safe and real one — whether in Syria or outside it. “I think being here for more than a year and a half is long enough,” she says towards the end of the film. That simple aspiration should be real enough to move us.